Inventory Management Inventory is one of the highest costs in your practice. Intelligent Inventory integrates seamlessly into ImproMed, ImproMed Equine or Advantage+ to increase your practice’s profitability by maintaining your inventory system. Streamline your workflow with ImproMed software, then add Intelligent Inventory to reduce costs, eliminate waste and increase practice revenue. Make inventory management fast and accurate with this cloud-based service. You order inventory by fax, phone, internet or through a sales rep, then Intelligent Inventory captures the details and generates a purchase order in your software. 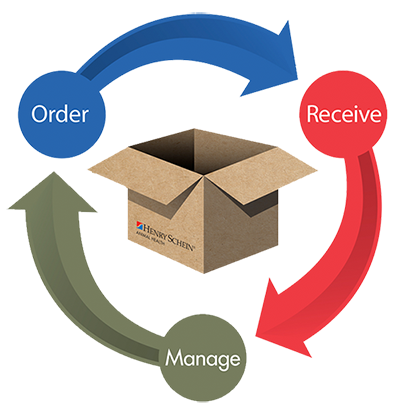 The distributor fills the order, updates the Intelligent Inventory purchase order and ships direct to you. When the order arrives, you check the packing slip and receive the entire order into your software. ImproMed will automatically update the inventory item quantity, cost, NDC numbers, and other important pieces of information. Manage pharmacy and supplies throughout your practice with this cloud-based tool. Cubex integrates with ImproMed and ImproMed Equine to rapidly provide accurate tracking, usage and dispensing. Your practice maintains control of medications, supplies, and controlled substances. Your patients have improved accuracy of medication dosage, managing expiration on medications, DEA compliance and overall efficiency. “We are an extremely busy small animal general practice and 24/7 ER with 17 doctors and support staff of over 70 people. We purchased two Cubex cabinets a few years ago and are now up to six. We plan on purchasing more over the next few years. Although there was an initial learning curve for our staff, they now love it and are wondering how we functioned without it in the past."